Taxol® (paclitaxel) has fascinated researchers, medical professionals, politicians and entrepreneurs for almost half a century. Its medicinal value as a potent anti-cancer compound has expanded greatly over time as new applications have been identified for the treatment of diverse indications. Knowledge of its complex biosynthesis pathway remains incomplete, with only 14 of the 19 genes well characterized. Despite this disadvantage, huge strides have been taken towards improving access to this diterpenoid compound and meeting the ever increasing demand. Productivity has increased thanks to the development of new methods, from the pioneering bark extraction techniques and complete chemical synthesis, to semi-synthesis from precursors such as baccatin III extracted from Taxus spp. plant cultures and the first attempts to produce taxol in non-native platforms. The entire pathway should be elucidated within the next decade, perhaps allowing its introduction into a host capable of gram per litre productivity. This review outlines major and recent findings related to the characterization of the taxol biosynthesis pathway, the evolution of production methods and future prospects for exploitation by metabolic engineering of a designed microbial chassis. The authors would like to thank Dr Richard M Twyman and Dr Birgit Orthen for assistance with the manuscript. Biggs BW, Rouck JE, Kambalyal A, Arnold W, Lim CG, De Mey M, O’Neil-Johnson M, Starks CM, Das A, Ajikumar PK. Orthogonal assays clarify the oxidative biochemistry of taxol P450 CYP725A4. ACS Chem Biol. 2016. https://doi.org/10.1021/acschembio.5b00968. Colling J, Pollier J, Makunga NP, Goossens A cDNA-AFLP-based transcript profiling for genome-wide expression analysis of jasmonate-treated plants and plant cultures. Jasmonate Signal Methods Protocols. 2013; 287–303. doi:https://doi.org/10.1007/978-1-62703-414-2_23. Ding MZ, Yan HF, Li LF, Zhai F, Shang LQ, Yin Z, Yuan YJ. Biosynthesis of taxadiene in Saccharomyces cerevisiae : selection of geranylgeranyl diphosphate synthase directed by a computer-aided docking strategy. PLoS One. 2014;9(10). https://doi.org/10.1371/journal.pone.0109348. Gadzovska Simic S, Tusevski O, Maury S, Delaunay A, Joseph C, Hagège D. Effects of polysaccharide elicitors on secondary metabolite production and antioxidant response in Hypericum perforatum L. shoot cultures. ScientificWorldJ. 2014. https://doi.org/10.1155/2014/609649. Gruchattka E, Hadicke O, Klamt S, Schutz V, Kayser O. In silico profiling of Escherichia coli and Saccharomyces cerevisiae as terpenoid factories. Microb Cell Factories. 2013;12. https://doi.org/10.1186/1475-2859-12-84. Khan AL, Hamayun M, Kang SM, Kim YH, Jung HY, Lee JH, Lee IJ. Endophytic fungal association via gibberellins and indole acetic acid can improve plant growth under abiotic stress: an example of Paecilomyces formosus LHL10. BMC Microbiol. 2012;12. https://doi.org/10.1186/1471-2180-12-3. Lenka SK, Nims NE, Vongpaseuth K, Boshar RA, Roberts SC, Walker EL. Jasmonate-responsive expression of paclitaxel biosynthesis genes in Taxus cuspidata cultured cells is negatively regulated by the bHLH transcription factors TcJAMYC1, TcJAMYC2, and TcJAMYC4. Front Plant Sci. 2015;6. https://doi.org/10.3389/fpls.2015.00115. Li MY, Jiang FS, Yu XL, Miao ZQ. Engineering isoprenoid biosynthesis in Artemisia annua L. for the production of Taxadiene: a key intermediate of taxol. Biomed Res Int. 2015. https://doi.org/10.1155/2015/504932. Mountford PG. The taxol® story–development ofa green synthesis via plant cell fermentation. Green Chem Pharmaceut Ind. 2010. https://doi.org/10.1002/9783527629688.ch7. Mousa WK, Raizada MN. The diversity of ant microbial secondary metabolites produced by fungal endophytes: an interdisciplinary perspective. Front Microbiol. 2013;4. https://doi.org/10.3389/fmicb.2013.00065. Naik PM, Al-Khayri JM. Abiotic and biotic elicitors–role in secondary metabolites production through in vitro culture of medicinal plants. In: Shanker AK and Shankar C (eds). Abiotic and biotic stress in plants - recent advances and future perspectives. InTech, Croatia. 2016: 247–77. https://doi.org/10.5772/61442. Osuna L, Tapia N, Cusido R, Palazon J, Bonfill M, Zamilpa A, Lopez-Upton J, Cruz-Sosa F. Taxane production induced by methyl jasmonate in free and immobilized cell cultures of Mexican yew (Taxus globosa Schltdl). Acta Physiol Plant. 2015;37(10). https://doi.org/10.1007/s11738-015-1947-z. Pandey RP, Parajuli P, Koffas MA, Sohng JK. Microbial production of natural and non-natural flavonoids: pathway engineering, directed evolution and systems/synthetic biology. 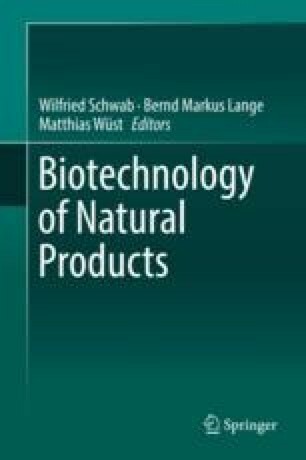 Biotechnol Adv. 2016. https://doi.org/10.1016/j.biotechadv.2016.02.012. Paungfoo-Lonhienne C, Rentsch D, Robatzek S, Webb RI, Sagulenko E, Nasholm T, Schmidt S, Lonhienne TGA. Turning the table: plants consume microbes as a source of nutrients. PLoS One. 2010;5(7). https://doi.org/10.1371/journal.pone.0011915. The Plant List Version 1.1. Published on the Internet. http://www.theplantlist.org/. 2013. Accessed 9 Mar 2016. Ramirez-Estrada K, Vidal-Limon H, Hidalgo D, Moyano E, Golenioswki M, Cusido RM, Palazon J. Elicitation, an effective strategy for the biotechnological production of bioactive high-added value compounds in plant cell factories. Molecules. 2016;21(2). https://doi.org/10.3390/molecules21020182. Thomas, P. Taxus brevifolia. The IUCN red list of threatened species 2013. 2013. https://doi.org/10.2305/IUCN.UK.2013-1.RLTS.T34041A2841142.en. Accessed 29 Apr 2016. Thomas P, Sekhar AC. Live cell imaging reveals extensive intracellular cytoplasmic colonization of banana by normally non-cultivable endophytic bacteria. Aob Plants. 2014;6. https://doi.org/10.1093/aobpla/plu002. Wilson D. Endophyte: the evolution of a term, and clarification of its use and definition. Oikos. 1995:274–6. https://doi.org/10.2307/3545919. Yanagi M, Ninomiya R, Ueda Y, Furuta T, Yamada T, Sunazuka T, Kawabata T. Organocatalytic site-selective acylation of 10-deacetylbaccatin III. Chem Pharm Bull. 2016. https://doi.org/10.1248/cpb.c16-00037.